Refined nostalgic styling and a signature precision build Stevens AeroModel airframe mated to a high performance affordable electric power system. 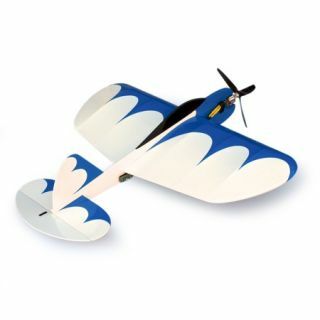 The incredibly satisfying RingRat 250 makes an ideal sport aerobatic control line park flyer. * Precision interlocking structure laser cut to exacting tolerances from hand selected AAA balsa. * Step by step 29 page photo illustrated instruction manual and flying guide. * Pre-formed spring steel landing gear. * 1/2A style control handle and 52' steel flying line set. * 1 roll AeroFILM or AeroLITE covering material. * Basic modeling supplies including Thin and Medium CA Glues.